Paper Whimsy has some wonderful Reliquaries. This is one of them I've had for awhile and had to get at. The papers are from the 12x12 collection of Graphic 45 - Nutcracker Sweet. I used little wooden blocks for the packages that became legs. The Sizzix Sizzlit Mini-Snowflake Rosette is from Tim Holtz. Mark Richard's glittered pearls adorn the top that's been painted with Pine Needles Distress Stain and stamped in the Tarnished Brass. This is the back view. I used Lime Ice Stickles on the top. Purple Ice Stickles are on the Diamonds. Ice Stickles add color AND sparkle! I added Ice Stickles in Christmas Red here and there and Gold Tinsel Trim on the inside. Orange Peal Ice Stickles make the inside color darker and more sparklier. True Blue and Silver Ice Stickles are on the Snowflake as well. I use various pens to highlight the color and make it richer all over and add shadows. Tea Dye Distress Ink was used, too, for more depth. I love the Glue n' seal from Ranger for working with the paper elements here, it makes life so much simpler! Three of my favorite collections added to make a fun little treasure. Check out Inspiration Emporium and Paper Whimsy with the links here for products! I used Gelatos on a Manila Tag then spritzed with water and guided the color with a brush. You have to be quick to keep them from running all together too much...so dry it with a heat tool. Then I added Clear Rock Candy Crackle Paint and waited a moment...then hit it with the heat tool. I used Vintage Photo Distress over the whole tag and edged with a black Sharpie. Here you can see the Crackle Paint better. I used the Classics #1 Stamper's Anonymous stamp collection, masking off the pear to add the bottom stamp. Then my favorite from Tim's Mixed Media collection, the chickenwire, was rolled on in various spots of the tag using Jet Black Archival Ink. My new favorite is a smooth brown chipboard for the background and a glittered gold ribbon. Depending on the angle...the tag is darker and lighter as you look through the Crackle Paint. But, basically, a very quick and easy tag....write on the back and it's a card of a different sort!!! Be Thankful...Spread a Little LOVE. Make a little iTunes cardholder for someone, or a moneyholder as a gift for just being a good kid, or a friend you're thankful to have. I just felt like embossing, and embossing some more.....so here's what I came up with. Make one with your own variations. Start with a #10 Manila tag. Emboss it with 2 Texture Fades from the Thankful Backgrounds and Borders set. The little one going on the very top of the tag. Score and fold twice measuring in 3 1/2 inches in from the bottom and then one more time. I rubbed Embossing Ink gently over the raised areas of the letters and leaves. I let it run over here and there, because it just did! Then I sprinkled 3 colors of embossing powders - Lettuce, Red Pepper, and Butterscotch and heated it up. You can brush off in between the letters, but I like the affect of letting if bleed...so to speak. The Swirl stamp from Urban Chic was added with Black Soot Distress Ink and embossed on the back section. Then I added Gathered Twigs, Mustard Seed, Rusty Hinge, Walnut Stain, and Spiced Marmalade all over the tag. Black Soot is on the edges. Last the Chickenwire stamp from the Mixed Media collection was stamped using Vintage Photo Distress Ink. I used a black permanent Ultra-fine pen to outline all the letters. Yes, the back is upside down...but that doesn't bother me. Turn it around and it's right side up...so it just depends on how you're holding it! Ha! I punched a hole and added the Hitch Fastener with three Chain Tassels on a Jump Ring. AND the good news...the Hitchfasteners are coming back CHA 2013! I've hoarded lots and lots of them! I also added a scrap piece of Grungeboard on the back of the hole for support of the Hitch Fastener. I trimmed about 3/4" off the bottom so it leaves space to slide the card in. Use Scor-it Tape on the sides to hold it shut. So make a little gift wallet for someone you're Thankful to have around. I'm finally here to show you what I made with my new shipment of goodies from Inspiration Emporium! This is a #10 Manila Tag that I used 2 Texture Fade embossing folders on....the new Holly Branch and the Snowflakes from Christmas Background and Borders. First run the Holly Branches and then carefully add the Snowflakes a few at a time around the tag. Then I spritzed the tag lightly with water. Now you can see why I embossed first. Because you add the Distress Stains over certain areas you want to have specific colors. Here I used Broken China, Pine Needles, and Dusty Concord. I also had a little Mini Mister with a long-forgotten formula of a light reddish color that I spread around to fill in the vacant spots. ...... I added various shades of the same colors to the tops with Distress Inks. Lightly brush the colors over the embossed areas especially the edges. Here I added Glue n' seal with a small brush and then layered on Distress Stickles Dry Glitter to the snowflakes. I used a heavier outline on the Holly Leaves to add more dimension. The Christmas Red Ice Stickles color in the Berries....add a few of your own here and there. I used a White water-based pen to outline and a brown Sharpie to paint in the branches. The Crinkle Ribbon is spritzed, crumpled and dried then tied into a bow at the top. I always like to glue my tags to chipboard for stability...here I used brown chipboard for a change. The Snowflake Sixxlit was used to cut a strip of 12" of Metal Foil Tape and another piece of cardstock. I adhered the metal to the cardstock and added Stream and a bit of Gold Metallic Alcohol Inks with a brush. The Distressed Doily Die was used on Crinoline for the circular doily. I matched the edge to create a turn that rounded out the doily. A little tricky, but it can be done! And now for the Snowflake center. You can see it's also run through the Vagabond with the Cracked Texture Fade...my favorite! This angle shows a bit of the Gold Metallic Mixative that is on some of the edges. I folded this snowflake the opposite of the way you're supposed to so the longest tips laid flatter and gave more of a pointed area to paint with the inks. It's all up to what you personally like. Enjoy the weekend....and Create ART! Just a short post....going to a 10PM indoor soccer game....GEEZ! But I had a few minutes after putting up Christmas decorations today to play with new dies the mailman delivered. ARE THESE TOO COOL OR WHAT????? Mini Snowflake and Snowflake Rosettes from Tim. LOVE the Ice Stickles on them, too! Well, the Christmas Emporium Centerpiece class was a real hit. I think I can safely say we all had a great time. Lots of prizes...a great lunch from CCC...and projects they were all happy with when they left. Having said that, we all headed out trying to get home before the storm hit...again. These are a few shots I took towards the end of the class. I will refrain from trying to remember everyones name here for fear of getting them wrong, but I'll never forget your smiling faces. Thanks to Linda, Claudia and everyone who came to the class from the bottom of my heart. Sydney was the first to leave having really done a smashing job in her little corner at putting together a great project! The smile says it all. Good Friends, Great Times....love these two. Aahhhh yes, a Dynamic Duo that worked hard and got a super little creation done. The Girls in the Back...ha...they had a good time and hey.....closest to the stamps and goodies! These two lovely ladies have come to several of my classes. It was so good to see them again. Now these two really worked hard. Claudia and Barb did a great job. And Linda is in the background putting together the new great papers from Graphic 45. A few hard at work with the day coming to a close. Many, many thanks to Linda and Claudia at Creative Cuts and Crafts in Elmhurst. And just a note to a couple of those who asked for a kit if any were left....they're all gone!!! YAY! 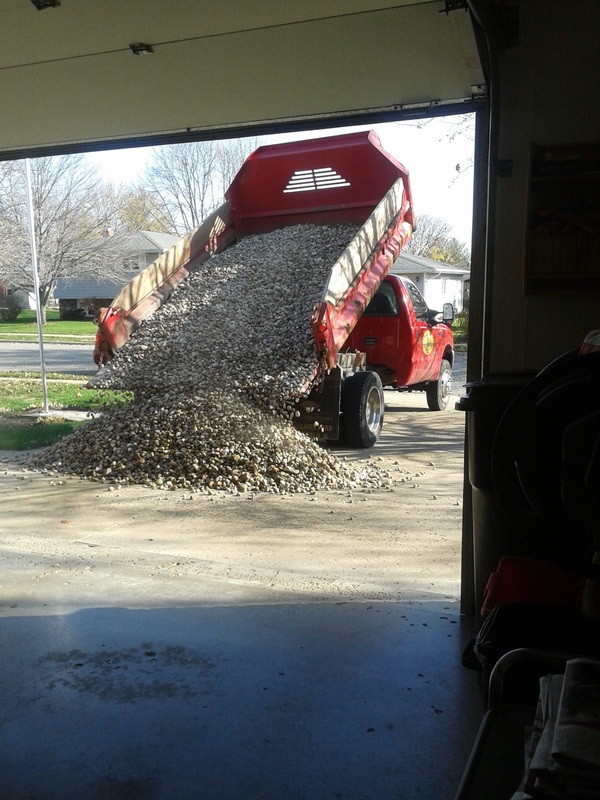 And this is what awaited us in the driveway...3 tons of River Rock for landscaping. 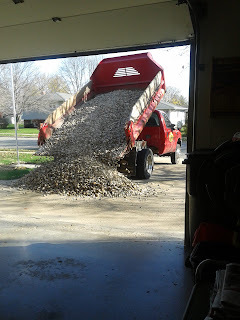 We got a lot of it done today. It really looks nice. 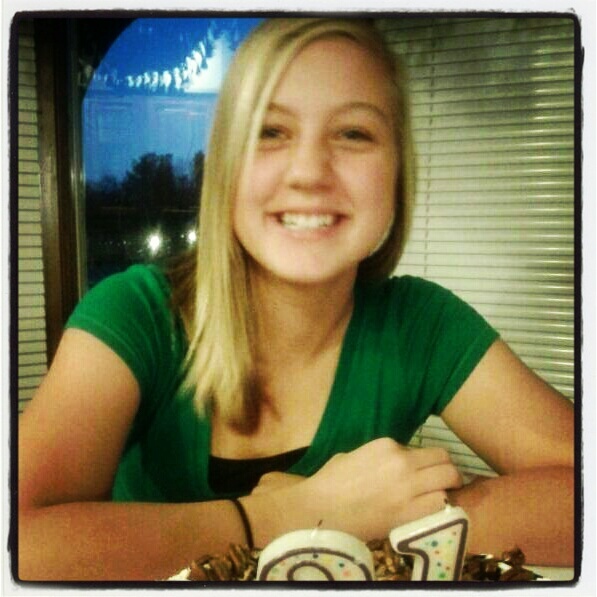 And I must share this beautiful shot of Erin on her 12th Birthday...not the 21 she played with in front of her as a joke. Such a great kid...talented, funny, and gorgeous to boot! Lastly this shot of the amazing work Cindyann and Lyn brought in to show me in Moline. Can you believe the Halloween village??? So glad they brought their Gypsy Wagons in that they also made from the Cloth Paper Scissors magazine article I wrote. I have 4 kits left of the Standing Curios shown here...and 2 of the 4 Square Metal Canvas kits...and that's IT! All gone. Let me know if you're still interested. So that's what's been happening in our world. Hope you've had a good couple of weeks at your place, too. Be well and Be Good to each other! I was so happy to see Dyan Reaveley at CHA again last summer...seems like eons ago, yes? But she asked the ever-talented Gentleman Jim and I if we'd like to work with one of her Journals. Are you kidding me, of course we'd love to...so I was thrilled when one showed up last week from Ranger. This is my 1st page to break-in the lovely book. I can see now I need more time to spend doing this, because once you start...it gets in your blood! This is the page layout after I sprayed the Journal. Add your Stencils with Distress Inks and your Stamps with Archival Inks. And just keep extending some of the stamped areas with more penwork. So get your Journals out, your stencils, your stamps and pens and get going....it's fun! Having some Friends over for Bill's early birthday party...we're both going up to Elmhurst this weekend where I'll teach my friends at Creative Cuts and Crafts. They always outdo themselves for us there. The class is a big one. But it's DEFINITELY a really fun one! Life is kinda back to NORMAL ..as normal as any of us are here...and believe me, none of us have ever described ourselves as normal. BUT, October is ALWAYS a very, very busy month with Band Competitions, Painting the Band Boards, Kitting up for classes, cutting down the garden, Soccer Tournaments, and this year, Emma's (quite successful) eye surgery. Anyway, I'm seeing light at the end of the tunnel, with relaxing around the corner. All kits are done and ready to go for classes. WHEW! to that. Only 2 seats left for Elmhurst. THAT should be a really fun day with old friends. Anyway, it was time to play around a bit today. 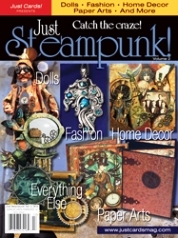 Meet a deadline for Inspiration Emporium's November DT Challenge. This is a a card I made...I know, don't faint dead away....I MADE A CARD!!! I started with a piece of Manila cardstock sprayed with Dylusions Sprays 1st. After I dried it with the Heat-it Tool, I added Copper Perfect Pearls Mists. Then I stamped the Oak and Maple leaves from the Autumn Blueprint collection of Tim Holtz's set with Black Soot Distress Ink and embossed them. I cut out the leaves. Love how they turned out! Then I had a bit of Shrink Plastic left that I'd gessoed before.....SO I stamped the Acorn 2 times, cut out, shrunk them down, and colored them in with Markers. The calendar papers were cut apart from Tim's Paper Stash for what I'd consider the Fall months. And last, the Metal Foil Taped die cut Grungeboard letters were embossed through the Vagabond machine. Layer it all up with foam tape, add some white pen marks and it's a done deal. So, check out the other DT members wonderful pieces here...and don't forget to enter the Challenge to win a $50 shopping spree!!!! You can't win if you don't enter. And one last thing...several of my friends and I are in the new Just Steampunk II magazine. It's loaded with over 300 pictures of fabulous Dolls, Jewelry, Home Decor and more..
...so check it out HERE. This is one of the pieces I have in there. A cuff bracelet is there, too. Be well, and Be safe....everyone.